Dividend Growth Investing (DGI) is a stock equity investment strategy that combines elements of growth, value and income investing. The basic concept of DGI is to buy shares of dividend paying stocks that have a history of increasing their dividend payout year after year. 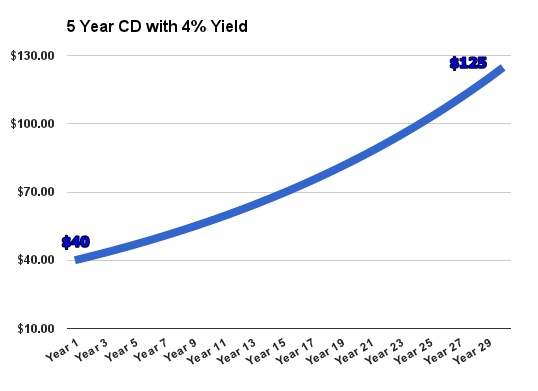 An investor took $1,000 and deposited it in a 5 year Bank CD paying 4% and rolled the CD over for 30 years (including interest). 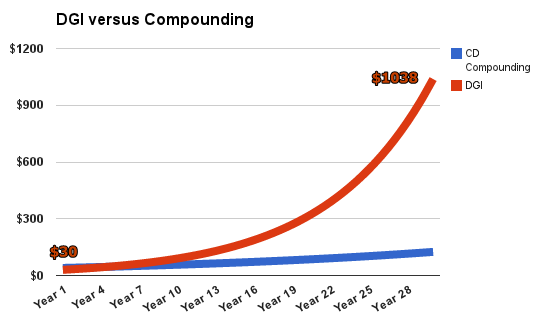 At the end of 30 years they will be earning $125 annually in interest, a very nice return and display of the power of compounding. But, when compared to an investor using the same initial $1,000 investing in dividend growth stocks that pay a 3% yield and increase the dividend payout 10% annually the difference becomes dramatic with a whopping annual payout of $1038 after 30 years. The examples above are fixed scenarios and may not reflect actual market returns but were used to demonstrate the difference in compounding versus compounding with dividend growth. Though historical dividend growth performance cannot predict future performance it is used as a measure of risk. Current Ratio - A liquidity ratio that measures a company's ability to pay short-term obligations. Free Cash Flow - A measure of financial performance calculated as operating cash flow minus capital expenditures.